NKP Salve Challenger Trophy 2011-12 played in Nagpur was a real exciting competition of the year in Indian domestic cricket. In this three team cricket tournament, two teams - India Read and India Green emerged as tied winners. Here is given the complete review of this tournament. 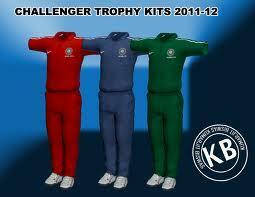 NKP Salve Challenger Trophy 2011-12 was played in Nagpur from October 10 to October 13. This three team event was won by India Red and India Green. India Blue was the other team and didn't reach the finals after losing both its league matches. In the thrilling final of the tournament, both teams ended up on the score of 238 and declared as the tied winner of the tournament. In the final, India Red and India Green faced each other. Both teams perormed brilliantly in the league matches. After winning the toss, the captain of India Red team Shikhar Dhawan decided to field first. His decision seems totally right when opening bowler Jaydev Unadkat gave some early blows to the India Green Team. He got rid of dangerous Robin Uthappa and Ishank Jaggi. After this early losses the India Green batsman Mohammad Kaif and Anirudha tried to build the innings. The tight bowling by Sudhindra and Bhargav Bhatt with regular wickets keeps the score of India Green to 238/8 in 50 overs. And this is also due to a good contributions of Harbhajan Singh and Kaif. Kaif made 41 runs while Harbhajan Singh played an innings of unbeaten 49 runs. While chasing the score of 238, India Red also lost wickets at regular interval. Opening Bowler Abhimanyu Mithun made the things difficult for India Red when he picked first 3 wickets. Harbhajan also got rid of Rayadu and Maneria. India Red were five down for just 102 runs. Fro here, allrounder Piyush Chawla enters the crease and showed some good hitting. But on the other end wickets were falling regularly. The match reached its climax when India Red need only 1 run in 2 deliveries. Wicketkeeper Muralidharen Gautam hits the stumps with ball when Piyush tried to take a single in the fifth delivery of the over. And both teams scores were equal with this and the Match was ended as a Tie.